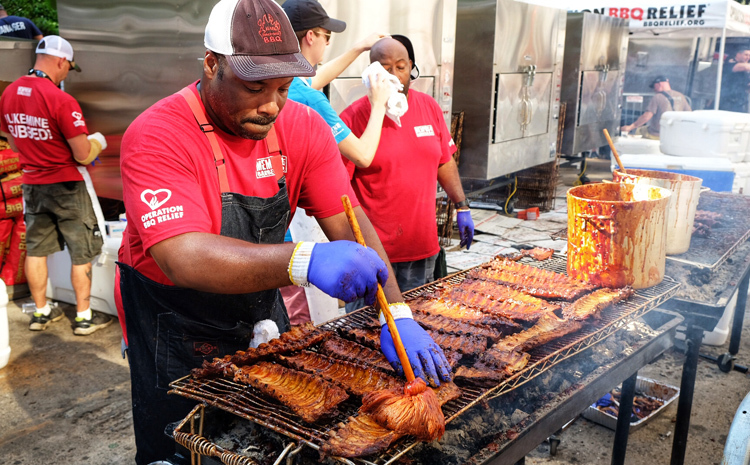 Curtis Barnes, lead coordinator for Operation BBQ Relief in NYC, works at the Big Apple Barbecue in June 2018 to raise awareness and money for the organization. Operation BBQ Relief, the top BBQ nonprofit in the U.S., is ready to deploy units to help feed victims of Hurricane Florence, which is beginning to batter both North and South Carolina. This incredibly dangerous storm is expected to cause immense flooding and destroy homes. “We are pre-positioned in the Charlotte area with Boss Hog, refrigerated box truck, a refrigerated semi truck with meat on it, a semi truck with non-perishable food and supplies on it, additional large capacity generators and several more smoker trailers. Our strike team is ready to move in when it is determined by officials to be safe. We anticipate Florence to cause disastrous flooding up and down the coast from the impact area and stalling out along that area for days. We have scouted several different deployment sites along the coast and inland near large populations. Since 2011, Operation BBQ Relief has helped many communities all over the U.S. by making and serving warm meals after natural disasters. OBR was there to help after Hurricane Harvey in Texas and Hurricane Sandy in New York and New Jersey, among many other deployments. I would encourage anyone who cares both about the BBQ community and hurricane victims to donate to Operation BBQ Relief. Donate here to help Operation BBQ Relief. If you are interested in volunteering, sign up here. If you want to follow OBR’s efforts during Hurricane Florence or want to get involved, you can follow them on Facebook or Twitter.